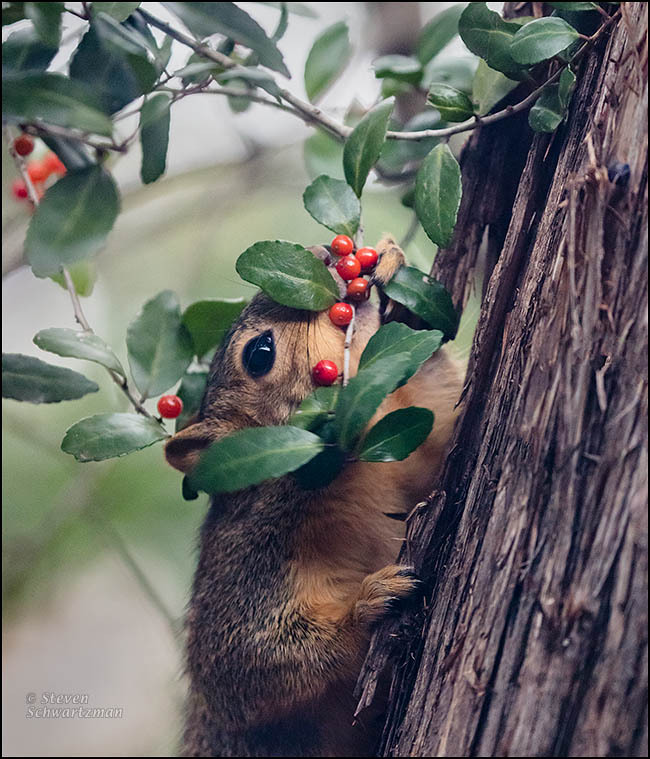 What the fox squirrels (Sciurus niger) are at again is eating some of the little red fruits from the yaupon trees (Ilex vomitoria) in Austin. Here’s a piece of the action right outside my computer room window on January 19th. Notice that while this squirrel held on to the trunk of an Ashe juniper (Juniperus ashei) with its right paw it used its left paw to pull a cluster of yaupon fruits against its mouth so it could bite one off. You’re welcome. Have you seen squirrels in Austin doing this? You can expand your collection of monkey toes to include squirrel paws. I absolutely love squirrels. We moved from a neighborhood that had them everywhere to one that is newer and doesn’t hardly have any. I miss watching them. Is there anything you can do to entice squirrels into your new neighborhood? I want to put a feeder out but I also want to start a vegetable garden and am thinking it may be a blessing in disguise not to have them around! That may be the better course of action after all. I’ve heard of people resorting to various devices to keep squirrels from taking the seeds intended for birds. Now that Lemony has said “Sweet,” how long will it be before Sweet says “Lemony”? What a great capture of one of my favorite beasties: aware of your presence, but fully committed to those berries. I don’t want to go off on a tangent, but one of the things I like about the photo is the way the diagonal line of the trunk is almost touching the circle formed by the curved yaupon branches. Going off on a tangent to talk about geometry is fine by me, especially with regard to a touching photograph. In fact I’m going to go off on an arithmetical tangent myself, as you’ll see in tomorrow’s post. I knew you’d enjoy the picture, given your pet squirrel history. A day or two earlier, I saw a squirrel pull off a twig with several yaupon fruits on it and scamper away with the cluster, presumably to eat them one at a time at its leisure, or perhaps bury them. A beautiful shot. I have seen them hanging by just their back legs and eating. When my daughter was little she used to tell me that we had flying squirrels and I would always say no we don’t. Then I watched them jump from one thin branch to another and sure enough they “flew” a short distance. It is good to be the squirrel! A squirrel is a lot safer jumping from one thin branch to another than we could ever be, and often at a speed that we can hardly follow with our eyes and human brains. You may have seen some of those films from the early 20th century where a man straps on large artificial wings and attempts to fly by flapping while jumping from the top of a haystack or barn or other high place. Ah, futility. This is the sweetest photo ever. Aw, you know I love the squirrels. This is a fantastic photo! I’m really drawn to the eye of that little critter and the pop of red in the berries. That dark, shiny eye appeals to me, too. Your comment about being drawn to it drew me to zoom in on the original photograph just now to see whether I might be reflected in the eye, but even at a distance of only a few feet I was too far away. What a great shot. I see a childrens’ tale – – the Yuletide Squirrel Comes Visiting. There’s a holly bush/tree next to my kitchen porch at home, but I’ve never seen the squirrels eating the berries like that, even though they come up on the porch, where the birdseed is kept. I was grateful for the picture, given that I had to shoot through glass that could use a good cleaning on the outside. Thanks to Photoshop for some digital cleaning. If you’ve a mind, you should write your children’s tale about the Yuletide squirrel. It could be the big hit of 2018. The yaupon is a native holly. Do you know whether the holly by your kitchen porch at home is native to New York? If it’s not, that might be a reason why local squirrels don’t eat its fruits. Or maybe they do and you just haven’t seen them doing it. Okay, we’ll await your cultivated report to find out if there’s a vogue for squirrels to eat non-native holly fruits. So I take it the squirrels can eat the berries without the suggested outcome? This is a very attractive photo of a squirrel. We have so many grey squirrels it is hard for me to get excited about them. We used to have red squirrels too but the grey squirrels out-competed them. We do still have a small population of flying squirrels, though. I’ve not heard of people ingesting the fruits in any form. As you suggested, animals can eat plants that humans can’t. A classic example is poison ivy, whose small fruits various animals eat with impunity. That isn’t a tea I’d venture to drink. I did think it looked like a fox squirrel but I wasn’t sure if you’d have a different, Texas specific species. I miss the fox squirrels although grey squirrels sometimes have pure black populations that are gorgeous. Then someday you’ll have to come down to central Texas and see the fox squirrels, along with the yaupons and possumhaws and many other native things here. That will be a fun trip when I can swing it. Your words brought “Swing low, sweet chariot” to mind. You gotta see my post ‘CAUTION!’ today if you have not done so already! So far today I haven’t seen any squirrels on that tree. I’m happy to have gotten this one good squirrel picture for 2018. That is a GREAT shot, Steve! There are no squirrels in NZ, at least that I’ve seen, and I miss them. I understand how you miss them, Jenny, yet I’m glad to hear there aren’t any squirrels in NZ, given the many alien species that people have imported over there. You’ll have one more thing to look forward to whenever you visit the US. I’m not particularly an animal photographer, Julie, but I’ve taken advantage of opportunities that have come my way, like the birds at several sanctuaries in NZ. And of course the easiest is when something appears right outside my window, like this squirrel. That is an adorable photo! The squirrel seems to be immune to the ilex vomitoria’s effects! As I understand it, the vomitoria refers to the effects of drinking a strong infusion made from the leaves. People can’t consume the little fruits in any form. Many animals, on the other hand, suffer no ill effects from them. A few days ago I saw several cedar waxwings eating some from the same branches shown here. And think of all the animals that eat poison ivy fruit with impunity. I already liked this photo when you first posted it, Steve, and I still do. You were at the right place at the right time to capture this hungry fellow in flagrante delicto, so to speak. Thanks for commenting on it a second time. I don’t know if I’ll ever see that sight again, but something’s always waiting out there in nature—naturally. What an amazing shot. Don’t you just love it when the photogenic wildlife poses just outside your window? Fortunately I caught this squirrel at just the right moment. There have been other good moments, along with plenty of missed ones. Twice last week, for the only times ever, a squirrel jumped from that tree right onto my windowsill, but the hasty pictures I took weren’t up to par. C’est la vie. It’s great to follow prompts that take us to a fantastic image – that also makes me smile! It would work well for a Christmas greeting card! Years ago I did some illustrations for a 90-year old lady in Louisiana. She had worked with archaeologists and also with the Indians of Catahoula Parish and said that if a young Indian male could drink Ilex vomitoria without vomiting, he was considered a man! It’s so great to have views like this right out the window. There’s a young macadamia tree at the corner of the house, and most every day a squirrel sneaks in to raid the nuts. I hear the tree moving, and I sneak to the window, watch for a while, then all but whisper, ‘Hey!’ – and of course it bolts/leaps out of the tree and to the carambola and sometimes on to the nispero. I snap a few photos at times, but usually I just chuckle and watch. I don’t think it will ever be comfortable with my presence! Sounds like you did a version of “Follow the yellow brick road” and instead of the great Oz you found a great squirrel nibbling on yaupon fruit. Speaking of which: not long ago I read that the notion of young male Indians trying to keep down a drink made from yaupon is a misunderstanding of the history and the botany—though obviously whoever chose the scientific species name believed in the folkloric account. Now I don’t know what the truth is. I’ve drunk yaupon tea and didn’t feel at all nauseated, though the dose may be a critical factor. but the squirrel is very sensitive to noise and movement, and so far every attempt I’ve made to open the back door to get a better shot has caused the squirrel to run away. It’s as finicky as the one you described raiding the macadamia tree. We’ll have to see if you or I eventually have better luck. At least you can draw what you’ve seen, whereas I have to get a decent photograph to consider myself successful. Yes, my photos don’t have to be great ones – just for reference, and then it’s easy to ‘edit’ by drawing/combing whatever is needed. Best is to work outdoors from life and then use the photos as backup reference. My camera chip and computer are having communication problems, a new prob as of last night. It was my fault for buying a not-so-perfect chip, but it was the best option I could find in the area…. sigh, there are problems in paradise! When I lived in Honduras I often felt frustrated by the lack of some things and the unreliability of others. At least you can always rely on your brain and its ability to move your drawing hand.